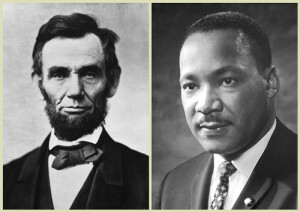 The struggle for racial equality has been represented in the work of Abraham Lincoln and carried forward most notably by Dr. Martin Luther King, Jr., both assassinated in the month of April. As a result of “Conversations on Race” between representatives of Calvary Missionary Baptist Church and the Abraham Lincoln Unitarian Universalist Congregation, we decided to hold a “Let Freedom Ring” March on April 9 to commemorate their work and urge a continuation of the struggle for racial equality. 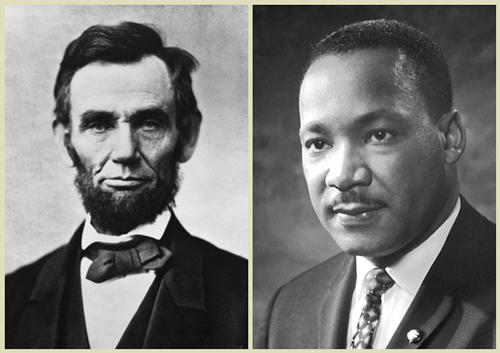 April 2015 offered a unique convergence of historic anniversaries connecting the Civil War and the Civil Rights Movement. On April 9, 1865, Union General Ulysses S. Grant met Confederate General Robert E. Lee to set the terms of the surrender of Lee’s Army of Northern Virginia. Bells reverberated across the Country in celebration. In commemoration of the 150th Anniversary of the end of the Civil War, the National Park Service celebrated ”Bells Across the Land: A Nation Remembers Appomattox”. While the bells tolled in some observances, focusing on loss and mourning, we sought instead to remember the unfulfilled promises that date back to the end of the war, promises that were thwarted during Reconstruction and still remain unfulfilled — a full one hundred and fifty years later. The marchers for this event convened at 2:15 at the Lincoln Home Visitors Center and range bells. Afterwards, accompanied by music and more bell ringing, they then marched to the Old State Capitol where Dr. Wes McNeese spoke about the significance of the event and the struggle for racial equality. We invited all citizens here in the home of Lincoln who were concerned about racial justice to join in this commemoration in the hope that we can follow in the footsteps of Lincoln and King. Organizers for the event included Rev. Silas Johnson of Calvary Missionary Baptist Church and Rev. Martin Woulfe of Abraham Lincoln Unitarian Universalist Congregation.